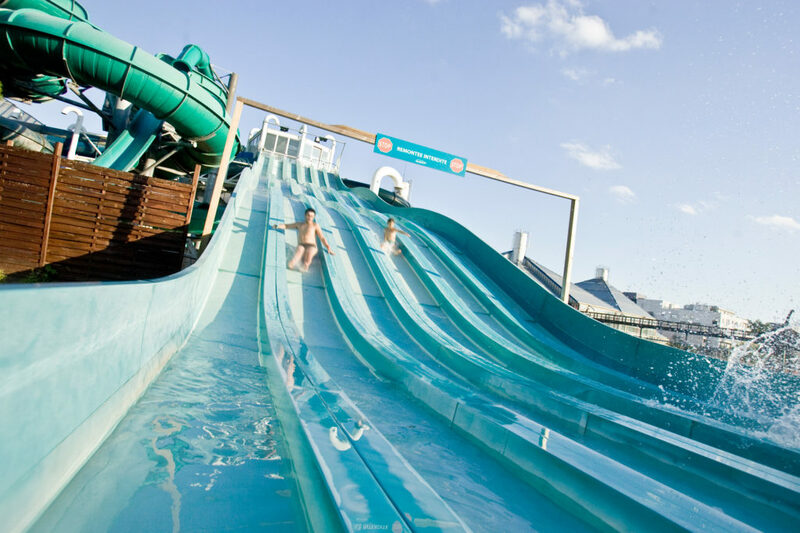 If you’re taking the clan to Europe and feeling anxious about entertaining everyone, we recommend one of these terrific waterparks to guarantee fun. Need three good reasons to include one as part of a European Grand Tour? You will avoid sunstroke from touring public squares in the heat. You will relax the human brain, which can only absorb so much culture in a day. You will enjoy a thorough washup after an overnight train ride. 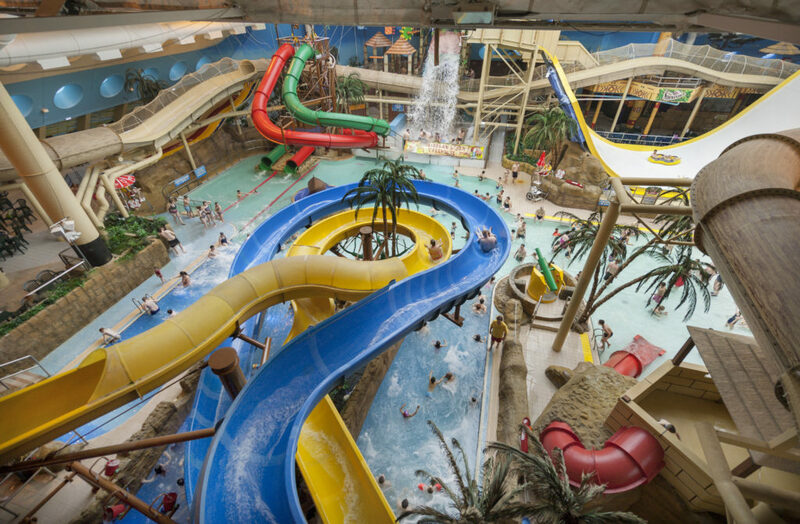 Here’s our pick of Europe’s top three waterparks, each with an indoors zone in case of inclement weather, that are well worth a detour from your scripted plans. Colorful Sandcastle waterpark in the U.K. looks like a child’s fantasy sand castle. With England’s naturally limited beach season, it makes sense that the UK’s largest indoor waterpark is at the coastal resort of Blackpool in Lancashire. On the sand at Sandcastle, it’s always a tropical 84°F, ideal for all ages to soak in the pools and enjoy more than 18 slides and attractions. The basic Sandcastle admission is perfect for a cooling off day, because it grants access to the Typhoon Lagoon wave pool, lazy river and rides that race through dark tunnels, using mat slides and rafts. Masterblaster, said to be the world’s longest indoor roller coaster waterslide, is one of the four towering thrill rides that require a premium HyperZone wristband. If you’re unsure of your appetite for waterborne thrills, start kids age 8+ on the Sidewinder halfpipe. Work your way up to the roof to board Montazooma, the high-speed 20-second ride that begins outdoors before curling back inside for the splashdown. On Aztec Falls – maybe better for teens — the two-seater rafts go dark, plunging into a swirling chasm before emerging into Aztec ruins below. The best area for younger guests is the Caribbean Storm Treehouse with a 600-gallon coconut splash bucket. There are plenty of water cannons and play areas at Fort Riptide too. Playing with adults? Ages 18 and older can chill at the Sea Breeze Spa, part of the VIP all- inclusive day out package that includes a stocked Tiki Cabana, meals, access to the waterpark and extra thrill rides. Of special note, Sandcastle has won awards for its accessibility to guests with disabilities. Check out the Accessibility page on their website for more information on ramps and access points, water accessible wheelchairs, facilities for guide dogs, reduced rate disability days and other amenities to see if Sandcastle meets your family’s needs for a day out. Rates: Adults pay £16.50 general admission, plus £6.50 for a Hyperzone wristband to ride the tallest slides. Ages 3-11 pay £13 as the basic price; ages 8 and up can pay £6.50 for a Hyperzone wristband. Check their website for current VIP Tiki Cabana packages. Waterslide with Antilles Beach below, at Tropical Islands Waterpark in Germany. 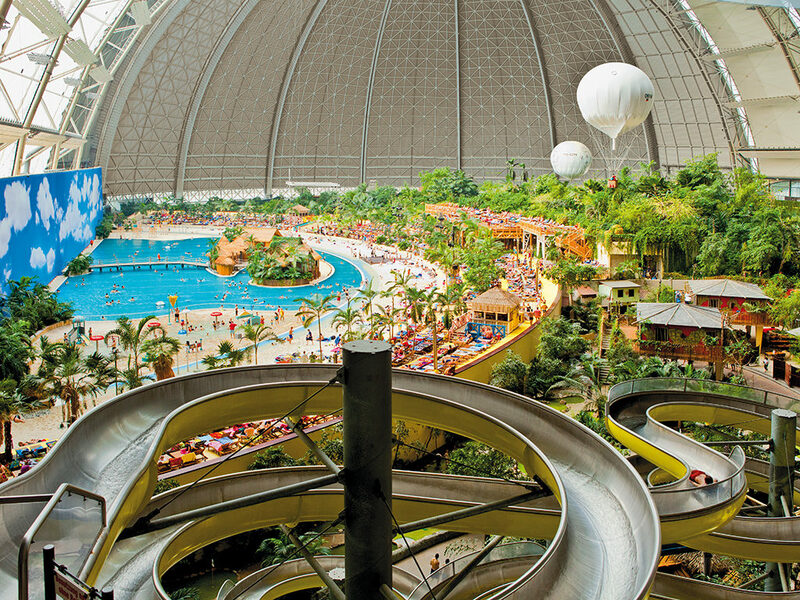 Occupying 64,000 square feet in a former Zeppelin hangar gives Tropical Islands in Krausnick, Germany a distinct advantage. True, it claims to have the world’s largest rainforest growing indoors and that’s certainly atmospheric. The enormous covered space keeps this playland weatherproof and a constant 79°F year round, Altogether, it’s an atmosphere that allows visitors to lose themselves in a distinctive tropical vibe. That tropical feel is also a cultural revelation, as Germans are a very adventurous and well-traveled group in general, and know their tropics. The waterpark’s theming includes more than 50,000 plants and an assortment of palm trees. Architectural elements and décor come from Thailand, Bali, Samoa, and South American and African equatorial regions. The enormous outdoor waterpark is called Amazonia and is similarly themed. Krausnick is just 37 miles from Berlin so you can do it as a daytrip, but for a real vacation from your vacation spend the night. Within their thatched Tropical Village, there’s a tropics themed hotel, adventure lodge, and a campground with tents near the South Seas white sand beach. Want to feel at home? There are holiday homes for rent from Novasol. Tropical Islands has three main areas: the Tropical World, the Tropical Sauna & Spa complex and the outdoor area Tropical Islands AMAZONIA. The park is also open 24/7 and lit by “moonlight” after hours, so many guests arrive at night for the “outdoor” concerts, acrobatics show, and the jungle ambiance. Parents can enroll kids in the Tropino Kids Club and let them go-kart or stay together to enjoy waterplay until dawn. Must-trys include Germany’s tallest waterslide, an underground waterslide and the Balinese themed lazy river. In the sophisticated spa, there’s a steam room for more humidity, a sauna for less, and a variety of Far East wellness and hydrotherapy treatments for an additional fee. Rates: To have up to 19 hours at the Tropical World indoor waterpark and the outdoor area (Tropical Islands AMAZONIA) the cost is 42€ adults, 33€ ages 6-13 and free for ages 5 and under. If you’re traveling with older children and spa fans, pay an extra 7€ to have access to the Tropical Sauna & Spa complex. Families can purchase a 125€ Family Ticket for two adults and up to four children ages 6-14 to use Tropical World and Amazonia. Children under 5 years enter free. Nearby are contemporary “nature homes” that sleep four, with two bathrooms and all the amenities. They rent for 330€ for a two-night package including all access to the Tropical Islands facilities. In contrast, hotel rooms are 120€ per person per night and include breakfast, free WiFi and other perks. Families can race eachother past Paris rooftops on Aquaboulevard’s outdoor waterslides. Also known as Parc Aquatique L’Aquaboulevard de Paris, this bright, 75,000-square-foot indoor and outdoor waterpark is part of the Forest Hill Fitness complex and a true escape from museum going. Outdoors in summer, families have use of a wave pool, splash zone with geysers, 10 water cannons that shoot up to 100 feet of water, and a waterfall, all watched over by lifeguards. There are 11 waterslides connecting the outdoors to the interior. When it’s time to relax, pull up a chaise longue on landscaped lawns or on the sand beach, and sunbathe. Inside, a fullsize replica whale becomes its own waterslide for younger guests. It hangs above more slides, a live palm garden, lazy river, activity pools kept at 84°F and a sand beach protected from the elements. Open year round, Aquaboulevard caters to the active visitor, who can learn to wakeboard in their wave machine; as well as the laid back, who can play minigolf, giant chess, or sunbathe on the sand beach under a huge solarium roof. This being Paris, there is a surprisingly good restaurant and a comfortable bar, plus a movie theatre. Rates: Aquaboulevard charges 33€ adult or 19€ ages 3-11. At night, after 5pm, there’s reduced admission at 15€ for adults and 9€ for children. Guests under 3 years of age are not allowed. If you’re in Paris for a long time, look into a Forest Hill recreation club membership. They have a lot of sports facilities as well as scheduled classes, including Born to Move fitness classes for ages 6-12 years.